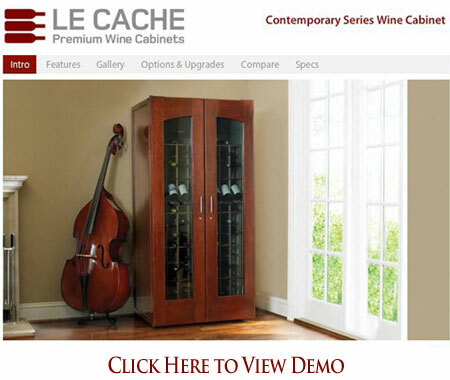 Le Cache Model 5200 Wine Cabinet Chocolate Cherry (P/N 741). Clean, contemporary design blends equally well with modern, Craftsman, Deco or Asian decors. Hardwood doors and gently arched windows showcase fine wine collections. Sealed seams, premium insulation and tinted double-paned glass provide thermal and UV protection.These options are included in the price of your wine cabinet. Unlike nearly every other cabinet or fridge I have purchased, this one actually holds the bottles they claim it does. And it does not tear up the labels in the process. It looks great and appears to be well built. Now that they are installed, I'm thrilled!